The most comprehensive global estimates of large-scale impacts of climate change are found in the work of Rosenzweig and Parry (1994) and subsequent studies (Parry et al., 1999; 2004; 2005). They estimate the number of extra hungry people, cereal prices and yield changes that may be caused by diverse projections of climate change. These studies develop a model that uses crop yield projections using locally calibrated information from diverse regions of the world. They estimate aggregate production for countries and simulate trade in the major crops based on relative supply and demand due to increased income and population. The research has evolved to incorporate ever more accurate information on crop yields and an ever widening set of climate and socio-economic scenarios, most recently the SRES scenarios (details developed in Fischer et al., 2005; Parry et al., 2004). The major findings of this work are that the potential for increasing yield in high and mid-latitude countries (discussed below), is balanced by decreases in yields in the tropics and sub-tropics. These studies take this information one stage further through modelling trade and global production - this shows production shortfalls in south Asia and Africa due to climate change through the 21st century and that these lead to a risk of hunger in those regions, not only because of climate change but also due to rising populations. The measure of risk from hunger used in these studies is the number of people whose incomes do not allow them to purchase sufficient quantities of the staple cereals at prevalent prices (Parry et al., 1999). These estimates must, of course, be treated with caution because they do not accurately reflect farmer adaptation and because the concept of food security and hunger is more dynamic than captured by the growth potential of the crops on which consumers and producers rely. In addition, rural economies are not necessarily reliant solely on agriculture and are often highly diversified (Ellis, 2000). Rising real cereal prices also affect demand for on-farm labour and farm profitability - such feedbacks are difficult to capture in the global modelling framework. Figure 3.2 illustrates projects of cereal prices at changes in global mean temperature for a range of major modelling studies. Studies that incorporate trade effects point to real agricultural output price decline even up to 2.5°C mean temperature increase as long as there are modest increases in precipitation (Adams et al., 1995; Darwin et al., 1999 - review in IPCC report; Gitay et al., 2001). However, the suite of results from Parry et al. 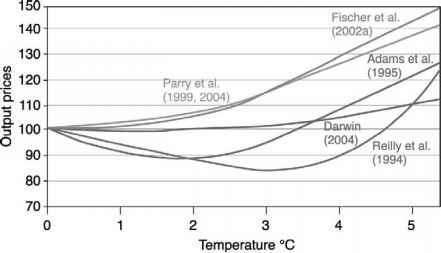 (1999; 2004; 2005) shows real price increases whatever the global mean temperature rise, reflecting increasing real scarcity in agricultural production given variations in future global populations and real demand for food. But although small changes in climate parameters in the major growing regions of the world over the next one or two decades are not expected to produce significant impacts on prices or absolute scarcity, this aggregate analysis hides real vulnerability and food insecurity both at local geographical scales and even for some regions of the world. The results from these studies show, given the caveats above, that world cereal production is projected to continue to rise from 1 800 million tonnes presently to around 3 900-4 800 million tonnes by the 2080s. The wide range of projected production is dependent on the assumed technologies inherent in the SRES storylines as well as the relative demand for cereals compared to meat and other foods that have positive income elasticities of demand (the scenarios assume rising real incomes in all parts of the world over the 21st century). Real cereal prices rise under all scenarios of change and the ultimate impact on people at risk from hunger is shown in Figure 3.3 from Parry et al. (2004). Figure 3.3 shows a large range, from 100 million to almost 300 million extra people at risk from hunger by the 2050s and up to 550 million extra by the 2080s due to climate change (assuming no offsetting [but highly uncertain] CO2 fertilization effects on yield). 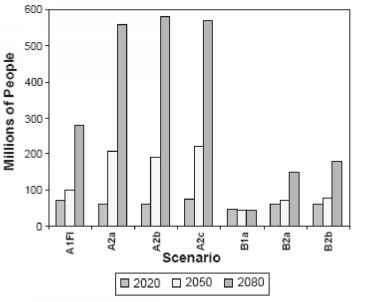 The vast range in these estimates is driven by human population - the A2 storylines in column 3 of Figure 3.3 assumes a total global population in the 2050s of 15 billion, compared to 7 billion in the scenario known as A1F1 in the first column (see Box 3.3 for a description of the SRES scenarios). What is clear is the need for significant adaptations to offset these potential negative impacts, particularly in low latitude developing countries. Parry et al. (2005) suggest that the potential for adaptation is greater in more developed economies (coupled with more favourable effects of climate change on yields) and hence that climate change will "on balance bring more positive effects to the North and more negative effects to the South; in other words to aggravate inequalities in development potential" (Parry et al., 2005). Source: From Easterling et al. (2007). 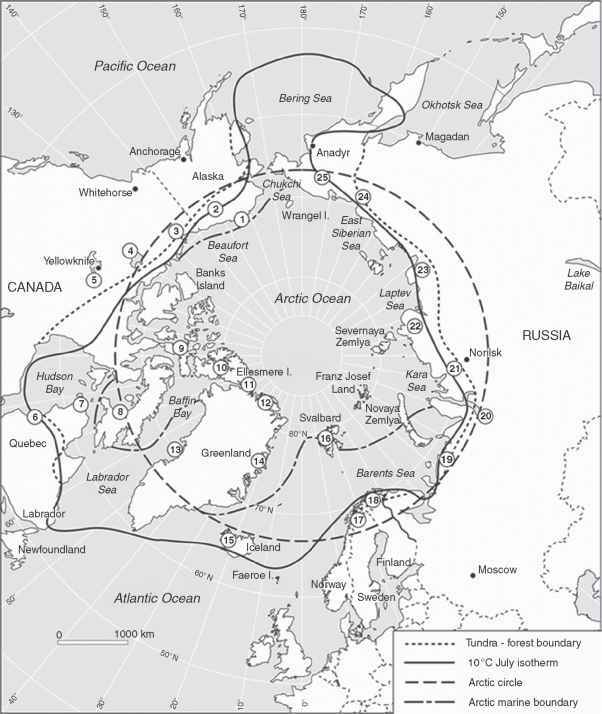 Source: Parry et al. (2004). While these results appear to be based on stylised accounts of production without significant adaptations and notions of food insecurity, they are backed by increasing evidence of localised impacts of singular weather events, such as drought and floods, on agricultural production and coping of the agricultural sector (Subak et al., 2000; Rosenzweig et al., 2001). Extreme events, such as hurricanes, impact on small and large farming sectors in the Americas and in Asia. Hurricane Mitch in 1998, for example, had well-studied impacts on agriculture in Honduras, Nicaragua and El Salvador. In Honduras one in five households lost assets as a direct result of the storm and many hundreds of people lost their lives. Economic policies that promote export-driven agriculture have been argued to have contributed to the scale of the impacts and the vulnerability of small farming populations. And there is some evidence that farmers who had adopted "modern" management practices suffered greater losses than those who had more traditional agro-ecological practices. Evidence from Nicaragua (Holt-Giminez, 2002) found that that the differences in impact between traditional farms and commodity-oriented farms actually increased with increasing storm-intensity: farming practices associated with integration into global markets were much more susceptible to economic and physical loss (see also Mainville , on recovery strategies in Honduras). There were also unexpected impacts and risks in agricultural regions, such as seventy tonnes of pesticides released into the environment in Honduras from the destruction of a number of warehouses (Jansen, 2003), exposing rural populations to long-term harm. In economies highly dependent on subsistence agriculture, drought has been shown to have impacts on the most vulnerable populations. At the extreme, vulnerable households cope through selling off productive assets such as livestock. But equally some households benefit: those with resources to take advantage of distress sales and the high prices of agricultural commodities (Roncoli et al., 2001; Little et al., 2001). The globalisation of agriculture and integration of agricultural markets has the potential to minimise the effect of regional climate change through trade, conversely the impacts may be exacerbated by increased specialisation. Food security is made up of four main elements (FAO definition): availability, stability, access and utilisation. Most studies focus on the impacts on food availability and access to food, without considering the likely effects of climate change on food safety and vulnerability (stability). Stability is related to climate variability and the ability of the system to cope with extreme weather events. Some important agricultural areas routinely cope with high levels of climate variability, such as the Midwest of the United States, southern Africa or south-east Australia, and adaptation to climate variability is nothing new in agriculture. However, areas subject to high climate variability are likely to expand in the future (Schmidhuber and Tubiello, 2007) and the rates of projected change may exceed historical experience in some regions. Climate change will also affect food safety and food security through the increased incidence of disease and including probable increases in food poisoning and water-borne diseases (IPCC, 2007). Schmidhuber and Tubiello (2007) extract several key messages in relation to food security from existing studies. The first is that it is very likely that climate change will increase the number of people at risk of hunger compared with reference scenarios with no climate change: however, the magnitude of the climate impacts is likely to be small in comparison with the impact of socio-economic development. In addition to the socioeconomic pressures, food production may increasingly compete with energy production in coming decades. Sub-Saharan Africa is likely to surpass Asia as the most food-insecure region, although this is largely independent of climate change and mostly the result of the socio-economic changes assumed in the SRES scenarios. Higher CO2 fertilization is not likely to affect global projections of hunger. In addition to localised studies of the impacts of extreme weather events, there is emerging evidence on how climate variability affects the ability of rural areas to thrive, even in present climates. Mendelsohn et al. (2006), for example, examine correlations between incomes in rural districts in the United States and in Brazil with parameters of present climate and physical parameters of agricultural productivity. They argue that climate affects agricultural productivity which, in turn, affects per capita income (even when this is defined as both farm and non-farm incomes for a district). Both Brazil and the United States are large and diverse enough in terms of climate to undertake such analysis. The study shows that higher temperatures reduce per capita income in districts in both countries and that increases in land value, net revenue per hectare and the percentage of land used for arable are all associated with higher per capita rural incomes. Hence, Mendelsohn et al. (2006) conclude that climatic changes that reduce productivity may have direct consequences on rural poverty: "hostile climates make it difficult for rural families to earn a living through agriculture".